Tenuta la Pergola was founded in 1903 in the town of Cisterna D’Asti in Piedmont, Italy. The winery is run by the founder’s great granddaughter Alessandra Bodda and her son Emmanuel who continued the tradition of farming local piedmonts varietals. The sandy and clay soils of the Roero and Monferrato, where their 30 hectares of vineyards are located, provide grapes that make softer wines than the marl-dominated terroir of the neighboring Langhe, creating aromatic wines that perfect for consuming young. 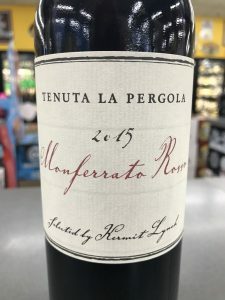 Monferatto Rosso is a lable specifically made for Kermit Lynch, a well known importer who has a knack for finding and selecting great quality and value wines. This is a food friendly red blend of Barbera, Dolcetto, Bonarda, Freisa & Croatina. It is a rustic medium bodied red with notes of cherry, irony minerality, and a dry, but not too tannic, round finish. This is a perfect pizza or pasta wine but also can be paired with many hearty winter dishes. Stop on in this week only (Jan 22nd– Jan 27th) to give this wine a try and get it for $9.99 (reg. $14.99!). Just ask one of our wine staff to pour you a taste.